Lately I've been making a pretty conscious effort to switch much of my routine over to more green beauty. A lot of this has come with the research I've been doing for Healuxe Beauty, my upcoming beauty boutique that I will be detailing further in an upcoming post! While it's hard to put aside some favorites like my beloved Verso Super Eye Serum, I've actually had a pretty simple time finding alternatives to a lot of my other favorites. In fact, in my quest to become more ingredient-conscious with my beauty products, I've actually found some superb options out there that have given me more immediate and drastic results than anything else I've tried. One incredible brand I've come across in my research has been S.W. Basics. As you can gather from the name, the goal behind the brand is to provide some amazing beauty products with just a few natural ingredients. In fact, the really cool part of S.W. Basics is that each of their products contain five ingredients or less, and all of the ingredients are recognizable names such as Apple Cider Vinegar or Sea Salt. Seriously. Just to compare, I checked out the number of ingredients on the back of a Clinique bottle and counted forty-four ingredients, at least 75% of which I did not recognize. The difference is fairly startling when you really think about it. Now other than being filled with all-natural, simple ingredients, I'm happy to say that what I've tried from S.W. Basics truly works. The brand was kind enough to send over their Face Exfoliant* and Hibsicus Face Mask*, and I'd be lying if I said I wasn't a little obsessed. 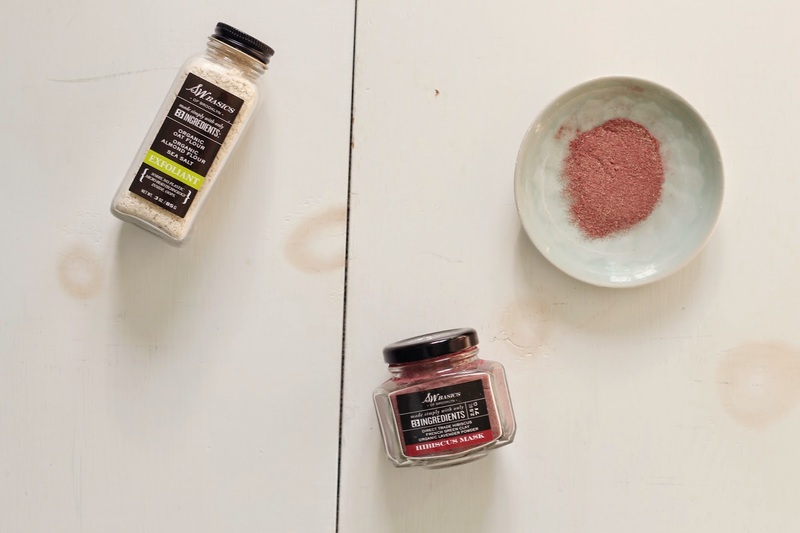 Their Exfoliant is made up of Organic Oat Flour, Organic Almond Flour and Sea Salt, and when combined with a little bit of water it provides the absolute gentlest exfoliation for your face. I have really sensitive skin when it comes to exfoliating, so I'm always a little hesitant to try anything out. With this guy, though, I found it removed any dead skin without any irritation or redness left over. The scent also reminds me of baking, which I kind of love. As much as I love their Exfoliant, I was absolutely blown away by their amazing Hibiscus Face Mask. The formula comes in powder form with three ingredients - French Green Clay, Organic Hibiscus Flower Powder and Organic Lavender Powder. The powder formula makes it pretty flexible for how you can use it too. While I've usually combined it with a bit of water, you can also mix it up with yogurt or honey for a more hydrating formulation. The color of the mask is stunning, and unlike any other product I've ever used. It's the beautiful red color that smells of flowers and is just completely wonderful to use all around. That being said, I should warn that the color is fairly pigmented, and I would not recommend using it around any sort of white clothing or cloth that could get stained (a mistake I will admit I have made). Now, as for the results, I've found that this mask can help give the most glowing complexion. It's a pretty potent formula (though don't confuse that with irritation, which this has never caused for me) that you can really feel working. It helps smooth and clarify your skin, and you can really feel it working as it's on your face. I usually leave it on for about half an hour (though it only takes about fifteen minutes to dry) and often wash it off in the shower to leave behind fresher, smoother skin. As you can tell, I'm more than a little in love with these guys. I already have a shopping list full of other products to try from this wonderful brand (including their incredible sounding Toner and Eco Cotton Rounds) and I will certainly be posting reviews of those once I give them a try. If you're interested in trying these two wonderful products out, S.W. Basics was actually kind enough to send over one of each for me to give away to one lucky winner! I've created tons of ways to gain entries (which you can find below) and will have the contest running for two weeks, until Sunday May 10th when I will announce a winner. Good luck! Giveaway rules: NO PURCHASE IS NECESSARY TO PARTICIPATE IN THE GIVEAWAY. Giveaway only open to United States participants. The Giveaway winner will be selected in a random drawing from among all eligible entries received throughout the Giveaway period. The Winners will be contacted by email within 24 hours after Giveaway ends and required to provide a full name and postal address. Winners will have 48 hours to respond to their notification email to claim their prize. If they don't respond, another winner will be chosen at random. The prize will be sent out by S.W. Basics. My recent favourite green products are from Odylique. Truly amazing and gentle on the skin. Love products with simple ingredients. I would like to try their fave exfoliate, it sounds amazing! I adore how S.W. Basics has such simple ingredients and an affordable price point. And the fact that they are now sold at Target makes them readily available. I feel like they are also wonderful because they are unisex!